For the past several versions (since Windows Vista, I think), if you hit the Windows key and start typing, Windows will search for applications. Since upgrading to Windows 10 with Cortana, she is only hit or miss at finding applications. And she doesn't do partial searches, either. WinKey + type "Paint" does not find "mspaint". Instead it suggests some applications from the store. WinKey + type "Excel" does not find Excel. Nor does typing "Word" find Word. However, typing OneNote finds OneNote. What is the reason for this behavior and how I can get Cortana to find the applications installed on my machine again? Is there a setting I am missing? If I browse to "C:\ProgramData\Microsoft\Windows\Start Menu\Programs" I can see that the shortcuts for these applications all still exist. But Cortana is not finding them. Everything from the Microsoft Office applications to IIS to Beyond Compare to hundreds of other applications I have installed. 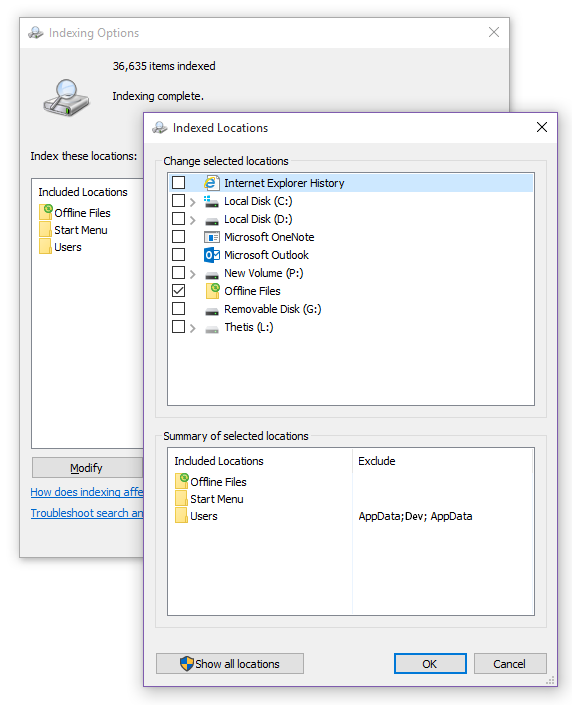 Where can I set which folders Cortana indexes? However, none of these applications are coming back as search results from the "start" menu. It may be related to this issue as well. The latest Windows 10 update (Threshold 2) has solved this issue for me. Cortana now finds all my files with no issues. Previously my only solution was to use Classic Shell, I've been able to uninstall that now and use the standard Windows Start menu. After 30 seconds the problem was solved on my machine. Incredible. If you're seeing some but not all of your Desktop apps in the start menu search and "All Apps", there appears to be a bug where Windows 10 will only register up to 512 start menu entries, which may be the cause. 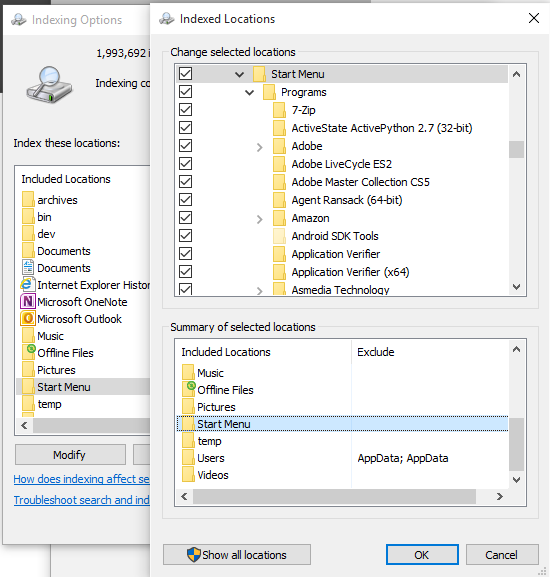 As you delete .lnk files from those folders, Windows 10 will automatically register Start Menu links that it had previously skipped over due to the bug without you having to do anything. If you run the powershell command again it should reflect the updated count. Once you get your count down to 512, your Start Menu search and "All Apps" should no longer be missing items. NOTE: An easy way to remove a whole bunch of unnecessary .lnk files is to delete all the links to uninstallers, since you almost always already have access to them via "Add/Remove Programs". If that is not enough, you can run WinDirStat against the two start menu folders above and sort by "items" in order to see which apps have added the most links. Lots of apps also add links to their website or documentation which you often do not need since they're just a google search away. For me, deleting the low hanging fruit was not enough so I ended up having to move a bunch of start menu folders for rarely-used apps to a temporary (non-indexed) directory. I'm planning on moving them back once the bug is resolved. In particular, Visual Studio, SQL Server, and Microsoft's various SDKs add a TON of start menu entries. It's hard to believe that something so fundamental to Windows and central from a user perspective can be this buggy. I had pretty much the same problem. I solved it by removing everything from the index except for the Start Menu. This might not be an option for you, as it appears that you like to be able to search across many folders. Before Windows 7, I used to use a tool called "Find and Run Robot" heavily, much better than launchy in my opinion, to find programs and files in addition to the start menu. It leaves your start menu alone, unlike the Start Menu replacements and works completely independently. One thing worth trying is Control Panel -> Troubleshooter -> View All -> Search and Indexing. On my Windows 10 (just upgraded from Windows 8.1), it found & fixed some permissions issues on search-related folders. Of course it hasn't fixed my search problems of not finding most Start Menu applications and settings (neither did reinstalling Cortana, messing with Index folder variations like just using Start Menu, rebuilding the index over and over, etc). Search worked mostly fine before the Windows 10 upgrade - sigh. Is automatically excluded from indexing the users (exclude appData). I've manually added that folder and am waiting for the index to build. Ok, doing a reindex of the search from the "Advanced Options" screen under Index Options (see screenshot) seems to be fixing the issue. It's going to take awhile to run, but already 7-Zip and Beyond Compare are coming up where they didn't previously (and those are alphabetically closest to the start, I suppose). EDIT Ultimately this only worked partially. It found some of the missing apps, but 90% of them are still missing. Plus there seems to be no way to add them back in. I think you're actually indexing too many files and that's stopping the search from returning useful results. Your Indexing Options screen shows around 1.9 million items indexed. I had about 1.5 million files in my index as well, with all of my development files under my C:\Users\<username>\ directory. My start menu search was really slow and was wasn't returning useful results (wouldn't find built in apps like Internet Explorer or Edge). I was able to fix it by resetting my "Indexed Locations" to the Windows defaults (Right-click start button -> Control Panel -> Indexing Options -> Modify). I also excluded my large development directories under my user directory (C:\Users\<username>\dev, etc.). Finally I triggered a rebuild of the index (Right-click start button -> Control Panel -> Indexing Options -> Advanced -> Rebuild). After waiting a little while for things to re-index the start menu is returning correct results as quickly as I can type! 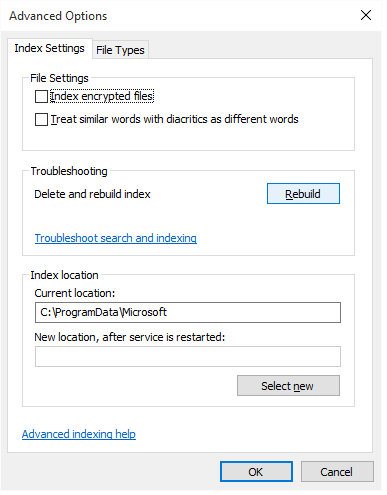 This FAQ on how to Improve Windows searches using the index is what tipped me off to the issue. Can I index my entire computer so all searches are fast? You shouldn't do this. If you make the index too large, or if you include system file locations (such as the Program Files folder), your routine searches will slow down. For best results, we recommend that you only add folders that you search frequently. On my account, Microsoft or local, that existed before the upgrade Cortana does not find Apps or settings. It now finds my documents after rebuilding the index. It doesn't search in "Settings" either. And even worse, outside Cortana, the search in the "Settings" panel search box finds nothing, even if the searched text is in the current search page! On a newly created local administrator account, just for test, it works like a charm. It might be an access-right issue somewhere. Note: In Windows Recovery Environment, C: can sometimes become D:, E: or even F:, depending on your computer's configuration. Log back into your original account. Cortana will not work immediately. (It is busy recreating the folder you just deleted.) But when it does, everything will be alright. Don't forget to delete the temporary user account. Important notice: By the time I reached the conclusion to do this, I had ascertained that Windows Search Indexer was working okay and it was Cortana's problem that didn't show the result well. My evidence was that Cortana could find literally everything else (including my music) and searches from File Explorer worked well. The more radical (and effective) solution to any of the indexing problems is to reset the Indexing Options to defaults. Since there is no official method to do this, one can use unofficial method, editing Windows Registry. 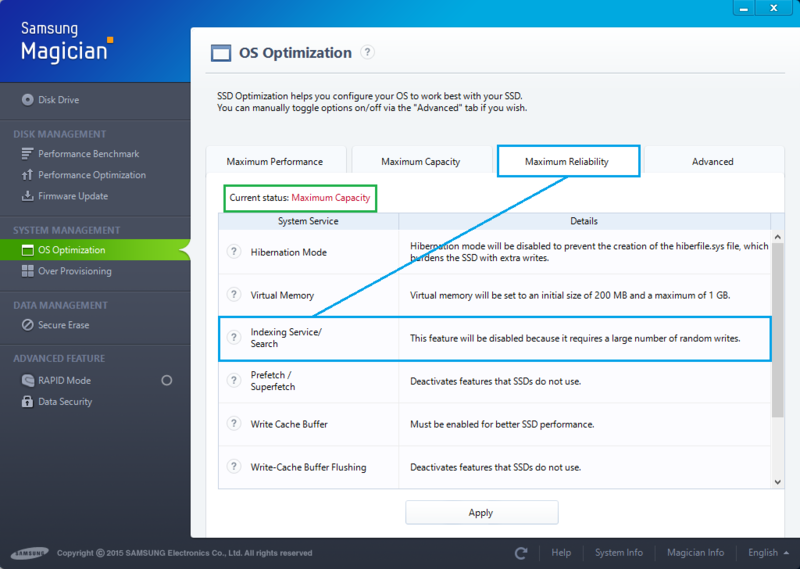 The steps to perform are described here: https://superuser.com/a/963621/210811. Find the Windows Search entry, click on it, and choose Stop from the left column. You can use the free home edition of Registrar Registry Manager for this. Follow the step #1, but click Start instead of Stop this time. This bug apparently existed since the Technical Preview. One proposed solution is to ensure that Program Files and Program Files (x86) are checked in the Indexed Locations window. Other people seem to have found that the bug only hits when the number of items in the menu exceeds 512. To verify this theory, I suggest to minimize the Indexed Location to the bare minimum and rebuild the index. Once the essential items are indexed and available, you may add more locations. A final solution is to install an alternative Start menu, such as the free Classic Shell. The Windows Start menu and Classic Shell can both be used in parallel. I fixed this problem by Enabling the Windows Search service in services.msc. Not sure if I disabled it during tweaking by accident or if it came like that after Win 8.1 upgrade. After re-enabling and starting the Windows Search service I could search my apps again. Then I opened up the indexing options and removed the user folder and the start menu folder (which can be found under C:\ProgramData\Microsoft\Windows\Start Menu). To do so, hidden files must be displayed. I clicked OK and closed the indexing options. Then I reopend the indexing options, added the two folders again, clicked on advanced and enabled "Index encrypted files" and I clicked on Rebuild. This solved the issue for me. Now Word, Excel and all programs can be found with the search. Maybe not all of my steps are necessary. After upgrading to Windows 10, Cortana search was not finding applications for me because the Samsung Magician software I installed for my SSD drive was configured to Maximum Reliability mode, which disabled indexing service/search. In order get Cortana to find applications installed on my machine again, I needed to change to Maximum Reliability mode in the Samsung Magician software. This answer will be helpful for anyone with Samsung SSD and Samsung Magician software. This worked for me and didn't involve changing search index settings or reinstalling Cortana. I could fix this by recreating my profile. There a serveral sub folders. You should remove the folder where the "profileImagePath" key matches you . Be carefull deleting the wrong folders here. If you do skip the step 4 windows will create on every restart a new temporary user folder with will be removed with a reboot. Be aware some test showed me the there seems to be no difference copying files to "C:\ProgramData\Microsoft\Windows\Start Menu\Programs" OR "C:\Users\John\AppData\Roaming\Microsoft\Windows\Start Menu\Programs". As well i read on some topics that you should NOT exclude the default library folders (e.g. dokuments, pictures etc) from the indexed folders because this will cause massive problems with the search. We had the same problem, but the cause was having UAC disabled. To fix, re-enable UAC and then rebuild the index. Where is the Snipping Tool in Windows 10? How can I make Windows 10 search my settings/control panel items?